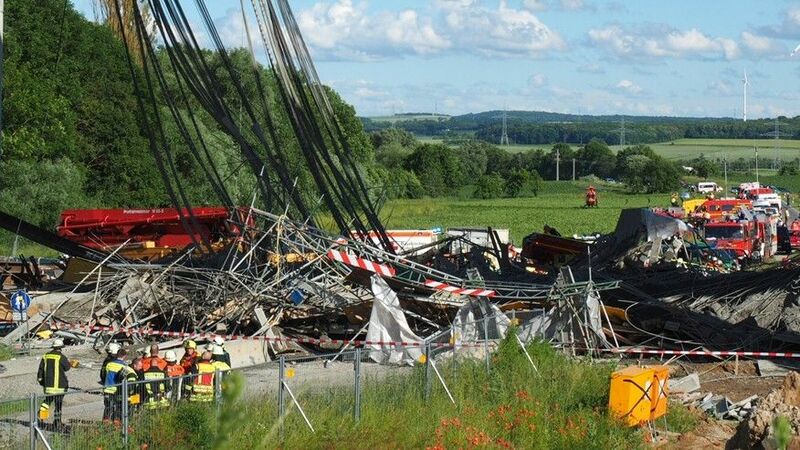 A section of a highway bridge that was under construction in southern Germany collapsed on Wednesday, killing one worker and seriously injuring a further six, police said. A 130-foot section of the bridge collapsed, said police spokeswoman Kathrin Thamm. Twenty workers were at the site at the time. In addition to the one dead and six seriously injured people, several workers were slightly injured, she said. It wasn’t immediately clear what led to the collapse of the bridge section, which runs above a smaller country road. The new bridge runs parallel to an existing bridge on the A7 highway near Werneck in northern Bavaria. Work on the new 774-foot span started last year and was supposed to be completed at the end of 2017.